Betty Milne was the Board Chair from 2011-2017.Betty served on the Long Term Planning committee for the 2017/2018 school year, and is now once again the Board Chair. 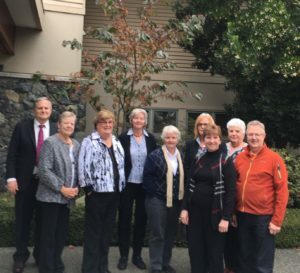 Betty comes from the public school system where for 34 years, she was a math teacher, school administrator, Director of Secondary Education, and for a short time, Superintendent of Schools in the Cowichan Valley. Betty has also taught sessional courses on math methods at the University of Victoria, as well as being a supervisor of student teachers. Betty had presented at numerous conferences and has co-authored three national math textbooks series. Now retired (although Betty still likes to keep her finger in Education), she enjoys reading, visiting with friends, and most of all, travelling. Marilyn Sandford has been a board director since 2015 serving on the Board’s Education and Long Term Planning Committees . She comes from the public school system where she was for 35 years a teacher, school counsellor, and school administrator at the secondary level in the Cowichan Valley. Marilyn throughout her career also worked with the school district , college , teachers, students and parents in Career Education. Marilyn enjoys spending time with friends, her family and especially her son. Annetta Probst has been a Board director since 2013, serving on the Board’s Education and Personnel subcommittees. She comes from the public school system where for 35 years she was a teacher, school administrator at the elementary and middle school levels, and Director of Curriculum and Instruction for the Victoria School District. Annetta has also taught sessional courses on Early Childhood Education, Language Arts Instruction and Evaluation for the University of Victoria and Vancouver Island University, as well as being a supervisor of student teachers. Annetta has organized and presented at numerous conferences. Now that she is retired she spends part of her time in Hawaii and the rest of her time in Victoria with family and friends and continues to be an advocate for lifelong learning. Robert des Trois Maisons has been a director since 2015. He has an M.A. in Theology from Oxford University and a B.C.L. and LL.B. from McGill University. He is a member of the Bars of Quebec and New York and of the Law Society of British Columbia. He has worked in private practice in Montreal, as in-house counsel for Alcan in Montreal and Sydney, Australia, and as Vice President, Legal Affairs of the British Columbia Investment Management Corporation. Now retired, Robert enjoys reading and travelling. Carmon Currie joined the Board of Directors in 2015 as Secretary/Treasurer and chairs the Finance Committee. She is a CPA, CGA and gained her finance management experience working in venture capital for 16 years in Vancouver before moving to Victoria in 2009. The move to Victoria allowed Carmon to explore her interests in gardening and cycling, work at BC Investment Management Corp. as Corporate Accountant for six years and most recently take on the Finance Manager role at Connect Hearing. Carmon enjoys walking, cycling, gardening and spending time in the outdoors with family and friends. Kim Laidman has been a board director since 2017 serving on the Board’s Financial Committee. She is a parent of an MMA graduate and has completed 31 years as a police officer working in many areas; high-lights include being a dog handler in West Vancouver, a team member of the Greater Victoria Dive Unit, attending the 2009 World Police Fire Games playing on the Vancouver Police Women’s Soccer team, and being seconded to the 2010 Olympic Security team. Kim currently supervises the Regional Domestic Violence Unit and has plans to retire soon. She has been active as a 4H Leader with the South Malahat 4H Fowl Creatures club and continues to volunteer as a Swim Official at Competitive meets that her daughter attends. Kim enjoys most forms of exercise and fitness and fills her spare time being active. Leo Bacon was a board director from 2010-2017, mainly in the capacity as Secretary/Treasurer. Leo spent the2017/2018 school year as a member of the Long Term Planning Committee and is now once again a member of the board. Leo s a CPA/CMA graduate and retired from the accounting profession 10 years ago. Leo has a wide variety of experience as a controller in the retail and manufacturing sectors. Leo in the last 26 years has worked in the public school system as a controller and Secretary-Treasurer in a variety of school districts both large and small. Leo enjoys outdoor activities: running, bicycling, kayaking, fishing and hiking. Leo and Darlene have been married for over 42 years and have just recently returned from a 5 ½ month trip across Canada. 2017/2018 school year as a member of the Long Term Planning Committee and is now once again a member of the board.